It is not just the Saudis, the Indians and other foreigners that are engaged in land grab in Oromia after all. Some in the Oromo Diaspora are also busy participating in displacing the Oromo poor from their land and sharing the booty with the TPLF regime of Ethiopia. The list is long but it includes Oromo church “elders” and community “leaders”. What is a parcel of land worth for these people? Their soul! Here are three of the MPLS, MN “elders and leaders” with Girma Birruu of TPLF/OPDO selling their souls for a few acres of land in Oromia. Thank God for the nationalists in MPLS (see picture below) for their continued effort to be the voice of our voiceless people back home. The purpose of this article is neither to imply that Oromo politics is a monopoly of one particular organization nor to undermine the contributions of many genuine Oromo political organizations and individuals to the struggle of the Oromo people for freedom. To the contrary, those who directly or indirectly contributed to the struggle of the Oromo people for liberation are acclaimed by the Oromo people. More over, as individuals or as groups, they will have a place in the Oromo history for their good deeds. Likewise, those who have commercialized and traded with the blood of Oromo sons and daughters will accordingly be judged by history. In light with the dire economic, political and social conditions that the Oromo people are in, it is not wise to divide the Oromo forces by forming ineffective small political groups that undermine the unity of our people at large. This division will kill the aspiration of our people for freedom. As divided and weak we are, we cannot challenge the Ethiopian dictatorial regime that perpetrates different atrocities against our people. Particularly, it is very damaging to the struggle when these groups develop an attitude of adversarial competitions against one another. The only parties that will benefit from our divisions are our adversaries. I hope every concerned Oromo can understand the damage these divisions and infightings have done so far to the struggle of the Oromo people for freedom. Why a Strong Secular Pan -Oromo Liberation Front? Now, when we are facing one of Africa’s most ruthless dictators that will never hesitate to use any means to stay in power, when tens of thousands of Oromo nationals are languishing in Ethiopian prisons and concentration camps, when Oromo youths are targeted and killed like hunting games by the Ethiopian killing squads, when thousands of students are forced to leave their education and exile to neighboring countries, and when some of them perish in the sea or in the deserts on their way to safety, when Oromo rural populations are evicted from their birth places and their land is given to Meles Zenawi’s officials or sold(leased) to foreign capitalists, when Oromo men and women, young and old, rich and poor, educated and uneducated, as a whole, are treated as second citizens and dehumanized by Ethiopian dictators, it is vital important to have a strong, secular, unifying pan-Oromo Liberation Front which can be up to the challenge of the time. Neither lamenting about “Ethiopian democratization,” nor creating small ineffective Oromo political groupings can be the answer to the question of the Oromo people. It is rather prolonging their sufferings under different Abyssinian oppressive regimes. The urgent need is to liberate our people from Abyssinian colonial rule. To do that, it is paramount to unite and rally all Oromo forces under one Pan-Oromo Liberation Front. Without such a strong organization that could unify and lead the Oromo struggle for liberation, it is impossible to think of the Oromo freedom. Without such an organization the Oromo will go on counting, from generation to generation, the number of Abyssinian dictators that take power in turn in Ethiopia. Perhaps, one may even witness a coming back of an Abyssinian autocrat or king. That is possible to happen. To have a secular Pan-Oromo Liberation Front is not a matter of choice. It is a must without which we cannot liberate our people. From this perspectives therefore, it is a must to revitalize the OLF which is undoubtedly an all inclusive Pan-Oromo Liberation Front. The OLF, as a secular Pan-Oromo political organization, has a long history in the struggle of the Oromo people for freedom. Its political program is nothing but the true reflection of the political, economic and social aspirations of our people. 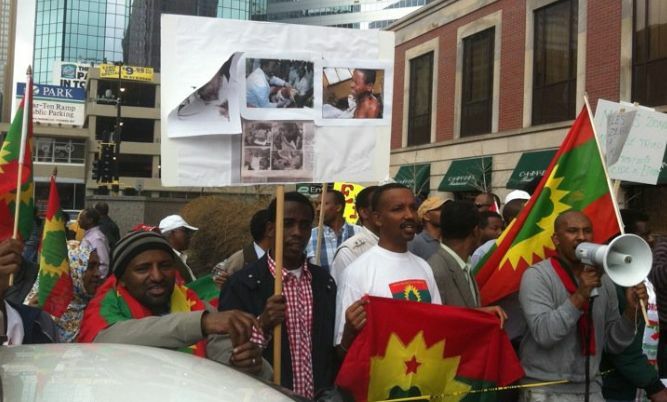 This desire and will of our people is once again confirmed in 1991 when the Oromo people converged into Finfinne from all corners of Oromia to show full solidarity with the OLF and its political program. The OLF is seen by the Oromo people not only as a liberation front but also as a symbol of unity. The OLF leadership and members have historical responsibilities to materialize the Kaayyoo of OLF that is interested in them by the Oromo people. This requires putting the cause of our people before personal interests. It requires genuine efforts of all concerned groups and individuals involved in the struggle to solve their political differences and forge unity among Oromo nationalists to revitalize the OLF so that it can reemerge once again as a unifying all inclusive secular and strong Pan Oromo political force. Unity here does not however mean handshakes and giving hugs to each other by the top leaderships without addressing properly the root cause of the division. The idea of Araaraa is not reconciling individuals at the top who can drift apart when they do not agree and come together when they want. The idea of Araaraa is to adopt a common political object (Kaayyoo) and common policy towards friends of our struggle and our adversaries. It is forging a common strategy to take the struggle of our people forward. In short, it is not a unity of different individuals or groups with different and irreconcilable political objects. It is rather the unity of political actions based on a common goal or kaayyoo. The means by which this kaayyoo is achieved also must be clear to all members and supporters of the front to avoid polarization and confusions. Obviously the means we use to achieve our object depends not only on how we want to achieve it but also on the nature of our adversaries. If our inherent human and democratic rights are flagrantly violated and our demands to make an end to these violations are always met with brut forces, as we have experienced under different Ethiopian autocratic and dictatorial regimes for more than a century, it is our right to use all available means to get back our lost humanity, freedom and dignity. The Ethiopian political infrastructure and the nature of the incumbent party do not allow a peaceful political settlement of the conflicts in the Empire. It is tried and failed several times by the OLF and other opposition parties. The political suppression and economic exploitation of the Oromo people under Mr. Meles Zenawi’s regime is getting worse from day to day. Equally, the political programs of some major opposition dominated by the former ruling groups are even worse than that of the incumbent as far as the national question is concerned. Forming an Alliance or trying to operate under the shadow of these oppositions will not give a solution to the question of our people either. Examining objectively the socio-political and economic relationships between the Oromo people and the Abyssinian ruling groups for more than a century, we find nothing that could make the OLF to change its political program and the means by which this political program is achieved. Today, the unity of the Oromo people is solid more than ever. Their resolve to get their freedom and be masters of their destiny is equally unshaken by the day to day brutality of Mr. Meles Zenawi’s regime. However, without a strong Liberation Front which leads their struggle this desire cannot be materialized. Therefore, it is important that the OLF reemerge as a strong Pan-Oromo Liberation Front, once again, to fulfill this mission. Whether we like it or not, with all the ups and downs it has faced, OLF still lives in the hearts and minds of the Oromo people. It is the responsibility of the Oromo political leaders, nationalists and intellectuals, to correct the faulty political trend and follow a viable political path to freedom. It is their duty to turn the silent Oromo majority into a useful and dynamic force. A Strong unifying Secular Pan-Oromo Liberation Front is a key to do that. The strength of an organization is a key to success. Whatever the nature of the organization may be, a dozen people that are well organized can do a better job than a thousand disorganized individuals. *It doesn’t matter who I am. What matters is my view. If you agree with me, let us do it. If not, let me know what a better solution you have. I am ready to learn from others and share my opinion with them.